What is the yard drainage like on your property? Water is one of the essential things we need for life and your yard needs it to grow and thrive. Unfortunately, if you have to much water it can cause problems - especially in your yard, your patio and retaining wall, and around the foundation of your home. If yard drainage is a problem and water is pooling in your yard it can kill your grass and become a haven for mosquitoes. This can become an eyesore to both you and your neighbors. Water can also create issues like mold, mildew, and cracked walls in your basement by pooling in areas around your foundation. Beemer Landscaping can use their years of experience in the Des Moines and Central Iowa area to alleviate these yard drainage problems on your property and around your foundation. We can eliminate any negative grade towards your home by sloping the yard away from your home's foundation. This will minimize basement leaks by improving yard drainage and removing places for water to pool around the foundation. like your neighbor's back yard! 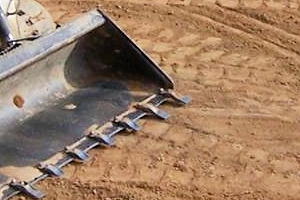 We have the equipment and expertise to determine the correct slope for your yard and put it in place. We will work with you to make your yard the usable space you want it to be!We service the entire Central Iowa area so contact us for a free quote or fill out our Landscaping Project Questionnaire. If you have other property service or lawn care needs we would highly recommend S & S Property Service in Polk City, Iowa. The owner, Chad Sutter can be reached at chad@greatpropertyservice.com or call (515) 402-3828.